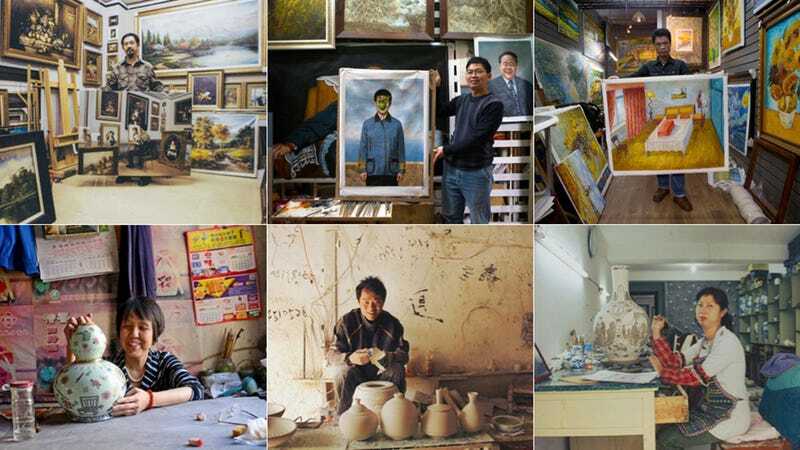 We've heard a lot about the evils of China's booming art copying industry, which hocks inexpensive replicas of everything from Expressionist paintings to priceless Chinese porcelain. But the people who make these perfectly-crafted copies are also artists in their own right—which is perhaps never more clear than when they're painting themselves. “The relationship between imitation and creativity can be intriguing,” say Zhenhan Hao, a China-born London-based artist. Hao is a student at London’s Royal College of Art, but for his graduation thesis, he adopted a different persona—that of a wealthy client. He contacted two different “copy” factories and commissioned pieces from a handful of painters and craftsmen. But unlike the orders these imitators normally receive from Europe, Hao proposed an unusual collaboration: He asked them to make art about themselves. “I built relationships with them by talking with them before I gave any commission,” Hao tells Gizmodo over email. “I designed briefs for each artisan imitator according to their experience knowledge and skills.” From two craftspeople at China’s porcelain capital Jingdezhen, where artisans churn out replicas of Chinese and Dutch pieces, he asked for a vase and a bowl decorated with their experiences at work. From five painters at Dafen Village, the well-known center for fine art copies, he asked for paintings that showed the artists and their work spaces. Over the course of the next few months, Hao and his collaborators got to know each other over emails and in-person visits. The works that emerged are complicated and fascinating—they’re new pieces of art, done in the style of the famed artists these workers are trained to copy.